Site- Cherry Blossom Dreams was started Sunday, July 28, 2002. Since then I have added anything CCS I could find! I have no stolen content, though I did (with permission) use images from other sites. My layouts aren't anything special, but I keep finding out more things on my computer programs to help improve the site. To find out which character from the shoujo manga, Penguin Brothers, you are click on the pic above. I'm Hina! Digimon use to be my fave. I loved Hikari... and that's where I got the name Kari from. I took a test, and I am most like her! Yay! I am most like Tomoyo! (I LOVE her!) Find out which CCS character you are! I'm most like all of my fave characters so far... 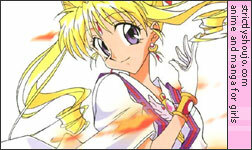 I am most like Maron/ Jeanne from Kamikaze Kaitou Jeanne. Find out which magical girl you are! I am the kawaii Pashmina! Which ham-ham from Hamtaro are you? Find out which Anime Pet you are! I am my favorite lil' cabbit, Ryo-ohki! My new favorite, The Lord of the Rings. 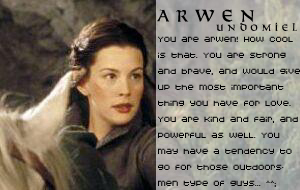 I am most like the elf, Arwen. Yay! Which LotR character are you most like? Yes, I think I'm very similar to her... 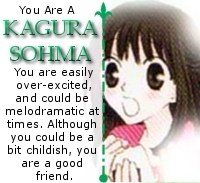 This is a cool test to tell you which Fruits Basket character you are most like! Disclaimer: I did not create any of these tests! I do not take any credit. Their creators should be listed on the page (the link) with the test.